Before entering the third floor gallery at the Museum of Art and History (MAH), the elevator doors open and an enormous graphic of a clenched blue hand with outstretched fingers and tensed tendons in the wrist — the Screaming Hand — greets you. The mouth at the center of the palm screams, exemplifying an anger and perseverance that everyone can relate to. Many have seen this image on clothing, bumper stickers and murals downtown, but few realize the impact it has made worldwide. 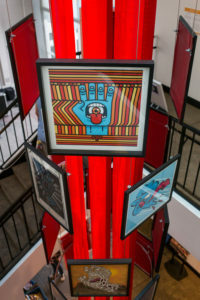 The Screaming Hand, one of Santa Cruz’s most recognizable logos, celebrates its 30th anniversary this year at the MAH in Santa Cruz. The creator of the logo, artist Jim Phillips, drew doodles of hands in his youth, which later inspired him to create the Screaming Hand for the local skate company, NHS Skateboard Manufacturer & Distributor. Phillips used to draw a cartoon of the clenched hand, sticking out the of the water, being circled by a shark. Years later, he saw a drowned man at the beach that reminded him of his older hand drawings and added a new take on the character. “The grim looks of the man and the ugliness of death evoked my own raw emotions and comingled the underlying artistic power of life and death to my hand drawings,” Phillips said. The emotion Phillips felt and embodied in the Screaming Hand also inspired many others to create their own versions for the exhibit. Starting in Los Angeles in 2015, the exhibition traveled to galleries in 25 major cities across the world, finally stopping in Santa Cruz in August 2016. The traveling show consisted of work from 50 global artists from countries including England, Taiwan and New Zealand. They used their own identities to reinterpret the Screaming Hand and make the gallery a diverse expression of skate culture. As more interest in the exhibit grew, more people started submitting their own versions. The Santa Cruz gallery invited some of those artists to display their pieces. It now features 200 renditions. 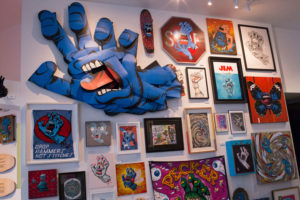 While some artists chose to alter the artistic medium through photography or wood, others reinterpreted the Screaming Hand by using pop culture to reference movies or celebrities. Artist Hasan Kamil included the Queen of England on a vintage plate, waving with the screaming hand. Decks, the flat board skateboarders stand on, are often customized with stickers and graphic art that represent the skateboarder. Phillips initially created the Screaming Hand as a sticker to sell skate wheels but as the iconography of the logo grew, it became prevalent on skateboard decks as well. Elise Granata, community catalyst at MAH, explained that in the ’80s and ’90s, skating was associated with being an outcast and lumped together with other subgroups like “hippies, punks and weirdos.” As skating continued to grow, art was a way for them to express their otherness from the mainstream. “This icon put [Santa Cruz] on the map and has blown up beyond our city to become a worldwide icon for skate, surf and youth culture,” Granata said. Skateboard decks hanging on the walls take viewers through the story of the gallery. One of them focused on why the Screaming Hand stays alive and current after all these years. “The Hand screams for those who are kicked off the streets, sent to detention, beaten down” was written on the skateboard deck. “But more importantly, the Hand screams for those who get back up.